Deena Kastor is most famously known in Chicago for her 2005 win at 2:21:25 and then breaking the Women’s Masters record in 2015 with a time of 2:27:47. 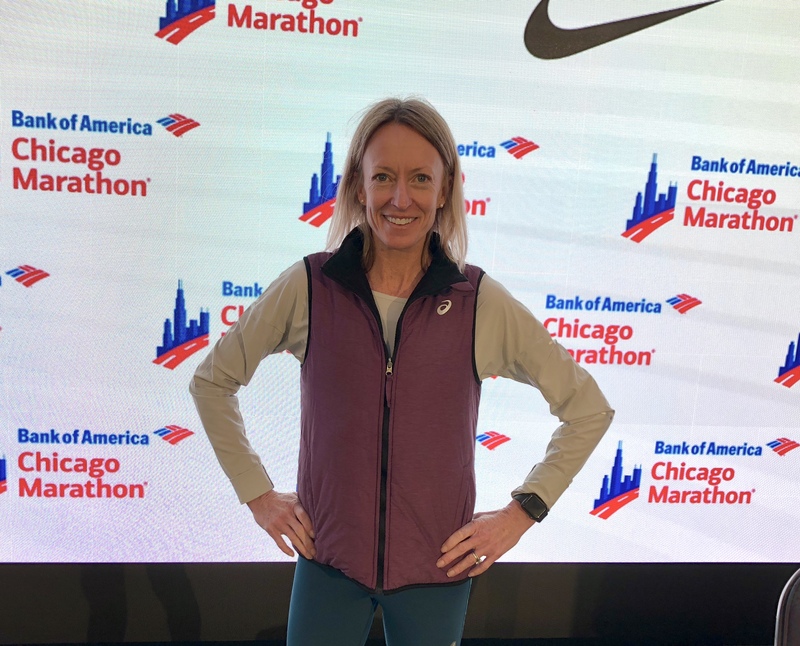 However, Kastor celebrates the Bank of America Chicago Marathon every year as a spectator and supporter because she loves the event so much. 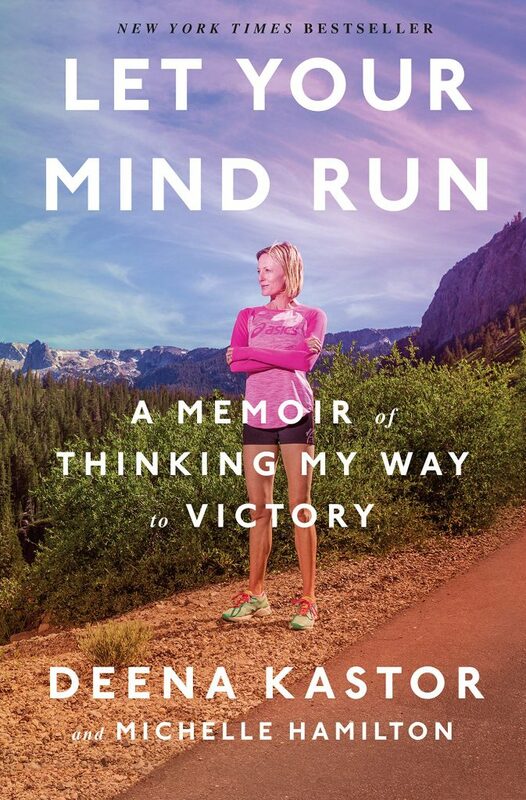 We got to sit down with her and discuss everything from her Chicago Marathon experiences and plans for Sunday, to her future in running, to the book she just published this spring. Chicago Athlete: What’s your favorite part of being in Chicago during marathon weekend? Deena Kastor: It’s always exciting no matter what capacity you’re here, whether as a runner or spectator. I think the fun of coming here earlier in the week and seeing the hype and momentum build is amazing. 45,000 people who have prepred for this are bringing their families in and are excited about the opportunity to prove their fitness or strength or repreent their charity. There’s such a wide variety of reasons people are out there and I think its awesome that those stories get to be told. CA: Favorite memory from your 2005 win? DK: Oh my gosh. 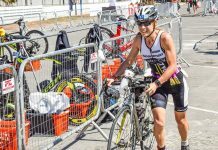 I think my favorite memory is seeing the finish line, but also mixed with the worry that my competitor was coming up very quickly behind me, it was that uncertainty but innate desire to keep pushing. I loved that mix of emotions. And then the relief when I hit the finish line right before blacking out and not knowing what was going on. So that tugging of emotion and then the relief of pulling it off was really special. CA: How does that compare to how you felt when you broke the Master’s record in 2015? DK: It was totally different, you can never run a marathon the same. I think in 2015 the lesson that stands out was having a poor build up; my allergies were bothering me, the California fires were bad so I compromised some workouts because I didn’t want to breathe ash. My daughter had the flu, and then I got it, and I almost backed out but my husband reminded me of hard work. So I shoved aside the excuses and it was such a great lesson: we can choose to listen to either side, but only one supports our mission. CA: This year, you’re here in a coaching role. Tell us about that. DK: Yes I’m here with Sarah Attar, who is the first female Olympian from Saudi Arabi, and Alexi Pappas, the national record holder from Greece in the 10,000 meters. My husband actually coaches them and writes their training programs, but my contribution to my team is being a mentor as we put in the miles together. I help guide them to be their own cheerleaders to realize that we have so many more capabilities than we can even imagine. CA: Where will you be on race day? DK: Well I already have Sarah and Alexi’s names plugged into the Bank of America Chicago Marathon app so I can track them. I’ll be with my friends at the VIP tent and then going to hand out medals at the finish line. 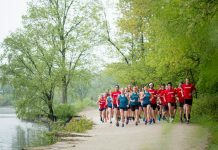 CA: As an experienced spectator, what tips do you give to others who may be overwhelmed on trying to find their runner? DK: As a runner myself, the spectators are so vital. I know some of the hardest sections is that last 10k, so if anyone is wondering where to go, I would say those last few miles when it’s a suffer fest for a lot of people, so an encouraging voice is always welcome. Again, the Bank of America Chicago Marathon app is really helpful. They also just partnered with Apple Pay, so if you have an Apple Watch you can make purchases with it and track them through the weekend. There’s also going to be tap-and-go cheer zones for spectators, where if you donate $1 to the parks foundation you get some free merchandise. Every year I feel like the spectator opportunities grow. CA: What would be your number one tip for runners? DK: Be as low key and convenient for the days leading up to it; it’s hard the night before the race to have complete confidence because there’s always that little bit of doubt and insecurity, so trust the training. If you’re having a hard time doing that, then look back at all those weeks of miles you put in. Even to get to that 20 miler is a huge accomplishment. Just understand what an amazing accomplishment it’s been already is a great reinforcement. CA: What’s your favorite thing to do in Chicago after the race? DK: It’s Chicago, so it’s obviously either going to a sporting event or finding somewhere good to eat. CA: What are your future running plans? 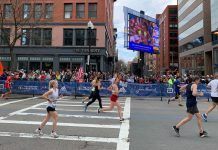 DK: I’m running with my teammates quite a bit, so I’ll probably run a spring marathon, either Boston or Tokyo because the World Marathon Majors races are so great. CA: Can you talk about your book a little bit? DK: Sure, it’s called “Let Your Mind Run,” it came out this spring. I felt very reluctant to writing a memoir, because I felt like who cares? I didn’t come from struggle, I’m from a very supportive, generous family and have had the privilege of working with great coaches along the way. But, as soon as my publishing company talked about it in the form of an instructional memoir, it resonated with me more. So it is a memoir, but I don’t want people to learn more about me when reading it, I want them to discover more about themselves. I give people tips on how to increase their optimism, because studies show that approach works. For example, it’s not just ignoring the rain outside, it’s thinking about where the nearest umbrella is and getting the job done despite the problem. When you’re taking care of yourself and living the life that feels joyful then you can spread that to those around you.